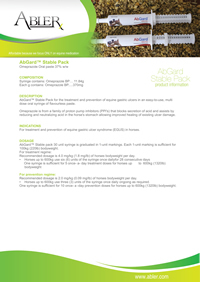 AbGard™ Stable pack 30 unit syringe is graduated in 1-unit markings. Each 1-unit marking is sufficient for 100kg (220lb) bodyweight. 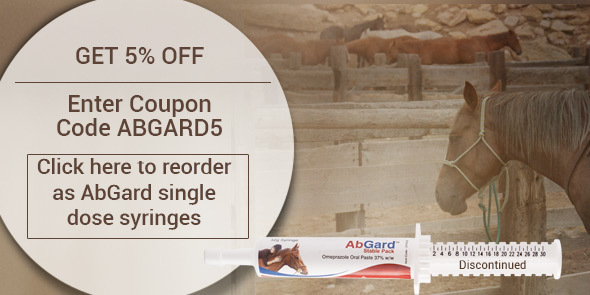 For horses up to 600kg use six (6) units of the syringe once daily for 28 consecutive days. One syringe is sufficient for 5 once a day treatment doses for horses up to 600kg (1320lb) bodyweight. For horses up to 600kg use three (3) units of the syringe once daily ongoing as required. One syringe is sufficient for 10 once a day prevention doses for horses up to 600kg (1320lb) bodyweight. IMPORTANT: If any dose is lost or rejected, re-dosing is recommended. Note that shelf life after first immediate opening is 28 days. Replace nozzle cover after each use.